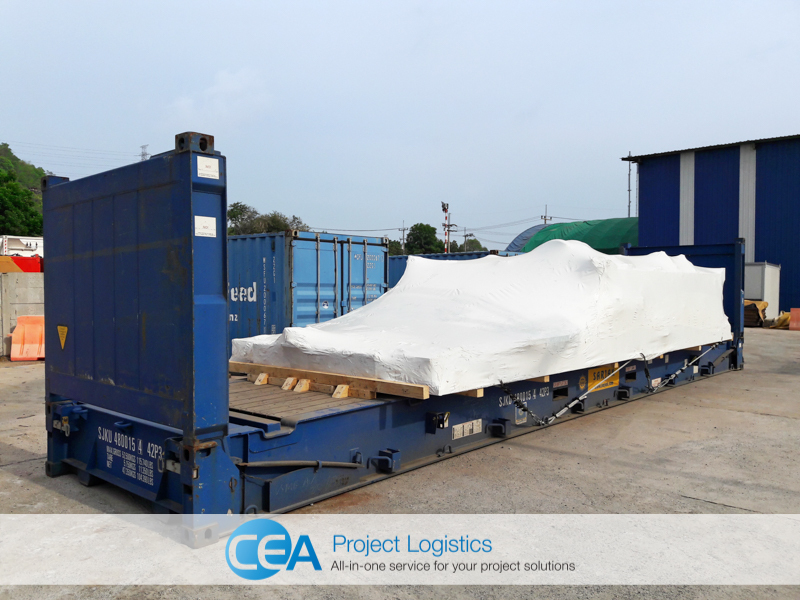 CEA Project Logistics in Thailand recently carried out the demobilisation and export of a 150 Tonne High-Pressure Plastic Injection Moulding Machine, the unit, after demobilisation was exported to Malaysia. The original factory installation of the machine was undertaken by Mitsubishi technicians who were also on hand for this demobilisation. The CEA teams began with disconnecting all hydraulic and electrical connections and other wired interfaces. Gates and fencing were then removed along with the hydraulic power packs which were packed into pre-fabricated temporary supports. The larger parts were next, this included access platforms, supply hopper and the SEPRO robotic arm. The SEPRO robotic arm assistor is used for the omnium unloading from the machine, some technical and expert rigging was used to ensure it was fully balanced while being dismantled from the main unit. 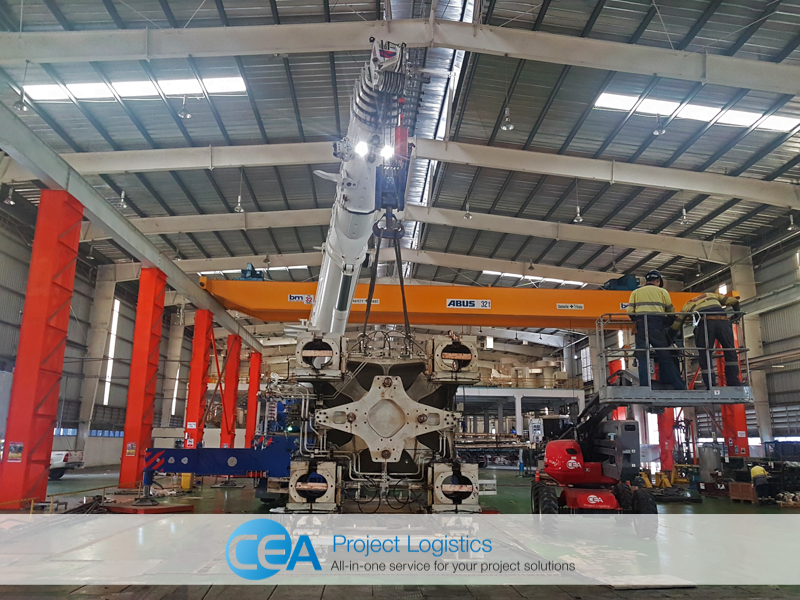 The SEPRO arm was lowered to the floor and supported whilst our expert team further proceeded to dismantle it into its respective structural movement axis. 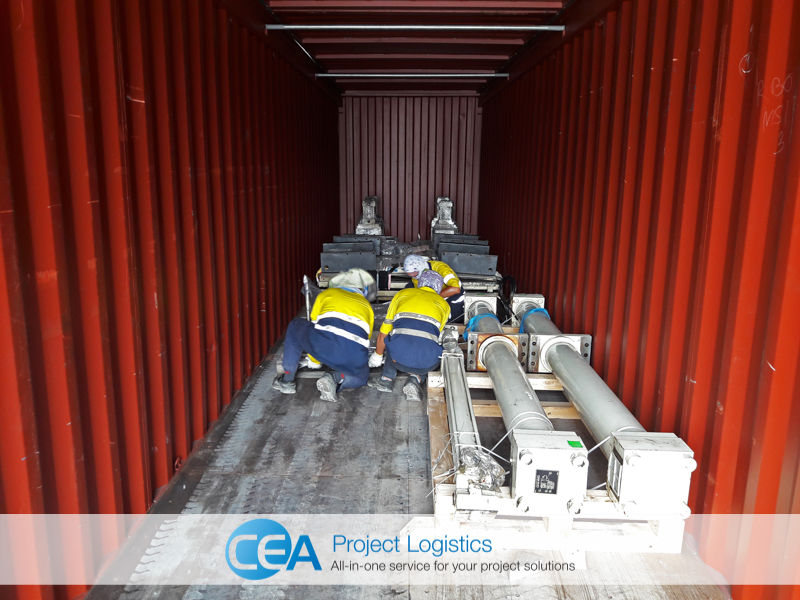 The injector unit was removed next and immediately transported to the CEA Facility in Laem Chabang for careful packing and Loadout. The heaviest components were the last to be removed these were the 46 Tonne die head and the rear platen with ejector unit at 42 Tonnes. The CEA project teams removed the tie bar cap plates after first draining the residual oil, and then by use of the cranes proceeded to slide out the four 6 Tonne Tie-Rods that connect the tie head and platen, each of these were immediately loaded onto wooden supports and treated for rust protection. Using special jig and tools specifically produced for this demobilisation, the teams lifted both the die head and then the platen by means of top and tailing cranes (120t and 50t respectively). 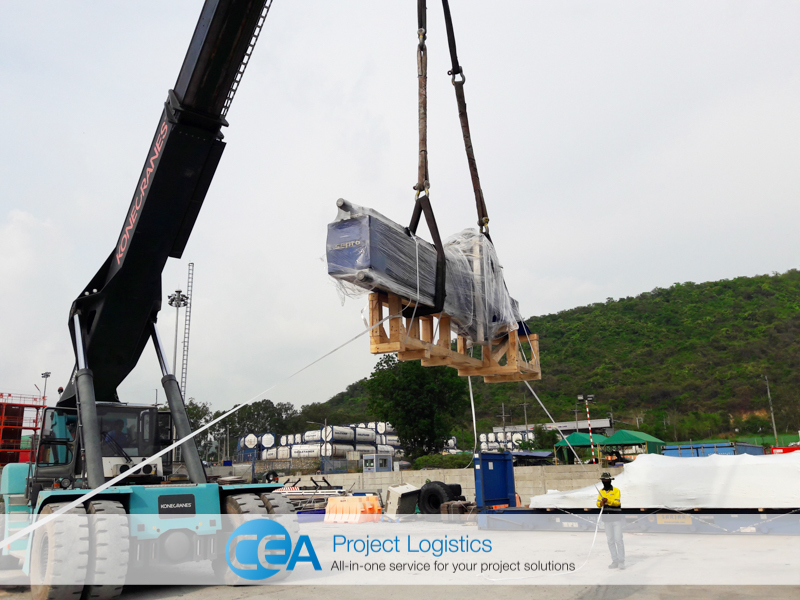 Both the die head and platen were moved into a horizontal position and loaded directly onto low bed trailers, they were then transported to the CEA facility. Upon arrival at the facility, all parts were thoroughly cleaned and prepared for export. The larger parts were shrink-wrapped and loaded onto flat racks while other auxiliary parts were packed and stuffed into standard 40 ft. shipping containers. The SEPRO Robot arm was lifted into an open top container and secured in place with ratchet straps and wooden chocks. 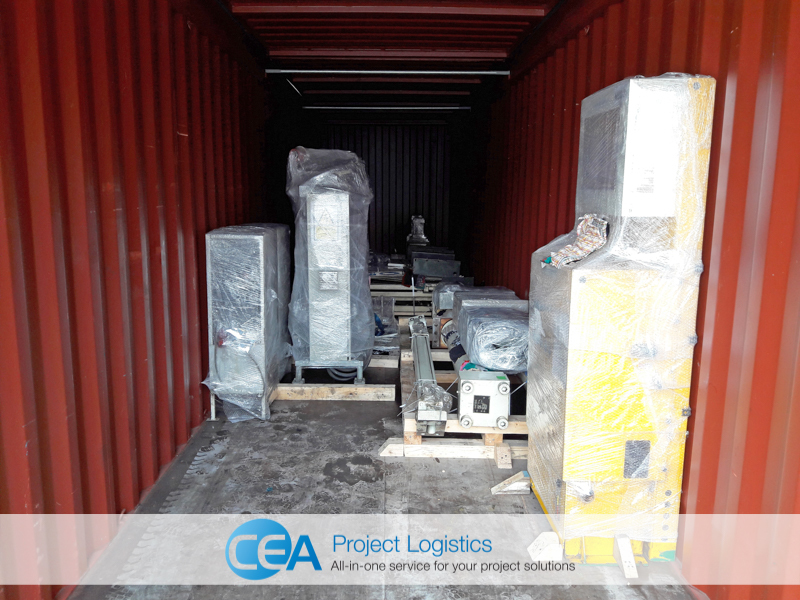 CEA Project Logistics completed all necessary documentation in preparation for export to Malaysia. This demobilisation project was completed in seven days. 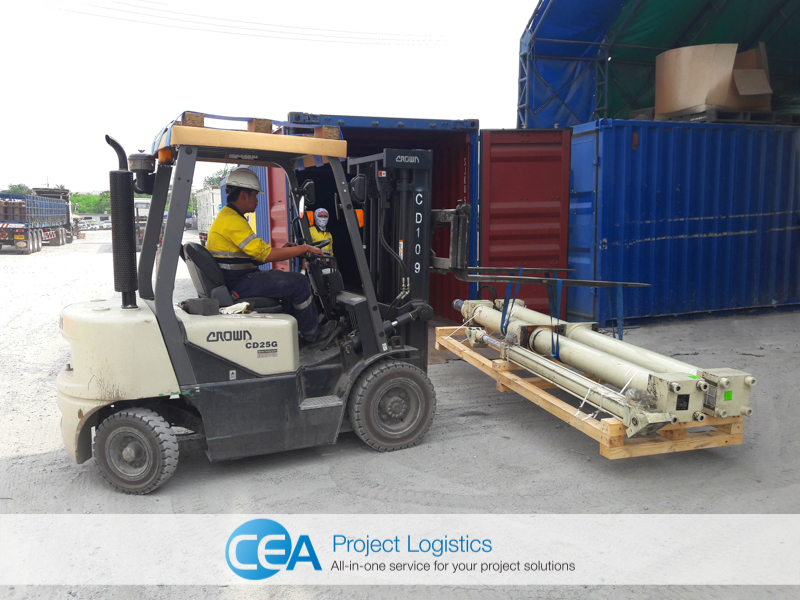 CEA is a company well established in Asia, founded on years of experience in heavy lift, project logistics, sea and road transportation, cargo consolidation and AQIS quarantine prior to export. 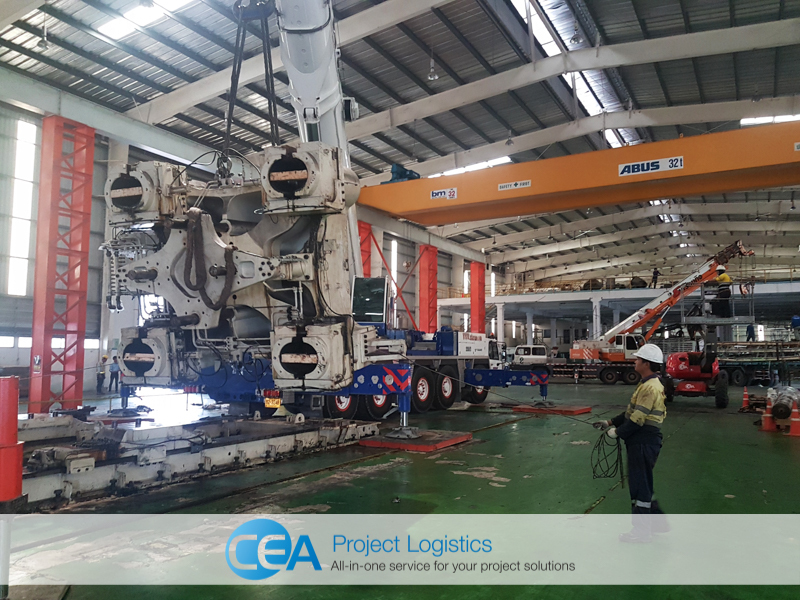 CEA offer a range of services from transportation, shipping, project logistics along with our new services that include equipment hire and Modulift heavy lift equipment.